Sale and Leaseback or “leasing zwrotny” is becoming more popular in the Polish market and many of the readers of this fine new blog will find themselves tempted to enter into a sales and leaseback transaction at some time. Your decision whether or not to accept the deal will mainly be taken on the basis of comparing it to other deals to see who will put up most money at the best rate and fees, but two aspects you should still consider are firstly the tax treatment of sale and leaseback and secondly the treatment of the leased-back asset in your balance sheet. These issues may seem secondary, but where the choice is marginal you should certainly include these considerations in the calculation, and they are things you should be aware of. 1. Taxation of sale and leaseback. You know the “leasing zwrotny” is one contact, the finance provider knows it’s one contract, but the tax office still treats this as two separate matters, the sale on the one hand, and a normal lease of an asset on the other. So, if the sale of the asset less the tax written-down value of that asset gives a profit, you will have a CIT charge. You may also be freezing money in the VAT system, as VAT will fall due on the sale element just the same as any other sale. (The best way to minimise the burden from this is to plan so that the lease is definitely classified as a finance lease, and make sure that both sides take place within the same month. Input VAT on operating leases is not all taken up front, and so you could end up with a surplus of output VAT to pay to the tax office with the inputs only coming back in future years if you structure the tax side of the deal as an operating lease). The ongoing depreciation of the asset will be either in the lessor’s books (operating lease) or the lessee’s books (finance lease) depending on the terms of the contract, and that can certainly make a difference between one deal and another being the best all-round option or not. This all depends on whether your organisation is one of those organisations (part of any group that is an EU listed stock) which must report in IFRS on not. If you don’t need to report on IFRS, then whether the leaseback is a finance lease or an operating lease depends on the terms of Polish Accounting Law (Ustawa o Rachunkowości). Under UoR, it is also possible to treat what is formally an operating lease (where the asset is held and depreciated in the lessor’s tax accounting books) as a finance lease, if the risks and rewards of ownership are transferred to the lessee in terms of substance over form, (which they almost always are with sale and leaseback), but many business reporting under UoR still keep their tax and commercial accounts the same, and since that is fine with the tax office, if it’s fine with the owners, then who else is going to complain about it? For financial statements produced only under Polish accounting law, you can also get away with recognising the profit on the sale of the asset in the profit and loss for the year, in the same way as you will for the corporate income tax computation, although in fact it is more prudent, accurate and legal under UoR to follow the IFRS policy as below, as long as you make the correct adjustments to get back to your tax computation. But if you do need to report under IFRS, then sale and leaseback transactions are to be treated in the commercial books as outlined in IAS 17:58-66, which specifically deal with “leasingi zwrotne”. That means that the lease will fall to be treated as a finance lease – regardless of tax treatment – if the risks and rewards incidental to ownership are substantially passed to the lessee. This is, incidentally, so in almost all cases of sale and leaseback that we can see on the market, by the way. The details of what indicates whether these risks and rewards have passed to the lessee can be checked against IAS 17 paragraphs 7 to 12, but basically it is up to you to convince your auditor. If it truly is an operating lease, then the good news under IAS 17 is that you can take the profit on the sale of the asset to the profit and loss account immediately. The bad news is that you won’t have the asset on the balance sheet any more, but then you won’t have the lease financing either, so that might be a good thing if you are still on the look out for more financing. If it is a finance lease in substance, then you have the asset and the new lease credit both on the balance sheet, but you have to take the profit on the sale of the asset and apply it over the course of the finance lease. This is because sale and leaseback is defined in IFRS as “usually interdependent, because they are negotiated as part of a package”, and therefore, just like you and the lender, but unlike the tax office, the IFRS sees the whole thing as a single deal. 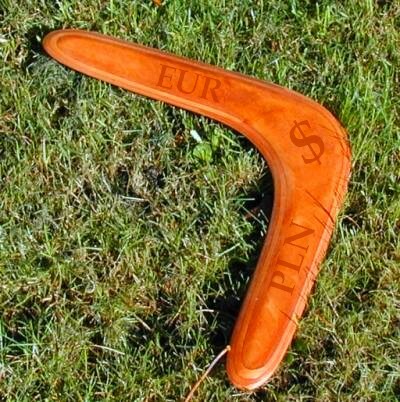 The asset going out and coming back is like a single throw of the boomerang. The moral of the story is that it could look worse for your balance sheet to do sale and leaseback if you are reporting under IFRS than under UoR. This looks like a great idea – a business strategy, accounting and tax blog covering different parts of Eastern Europe. Good luck with that!